2 divings can be done in the morning on different sites. 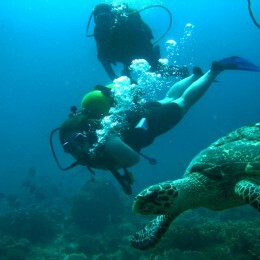 All levels accepted, first dive possible, diving course, equipment provided. From July to the end of November humpback whales stays in the bay of Nosy Be. Whale watching excursions are organized from the hotel for a closer look and unforgettable moments. For information visit the dive center website, Nosy Komba Plongée.